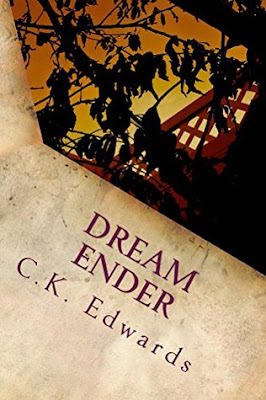 The premise of this book is very interesting, boy who destroys dreams when they enter the real world, and I was hopeful about how it would play out. I was not disappointed, C.K. Edwards is one of my favorite self-published authors and this book is a great representation of what he is capable of. I found the amount of action and romance to balance each other well. The plot line was engaging and the character building strong. It was hard to put down, especially with the cliff hanger endings Edwards uses for his chapter breaks. I became genuinely invested in each of the characters and found Vincent to be a great protagonist who drove the story forward, always doing something and never stagnant. It was interesting to think about what our world could really be like if dreams, nightmares, became reality. I did feel like something was a little off and I couldn't quite put my finger on what it was at first. I thought that maybe it just wasn't as polished as works I've read that are published via a publishing house, but after awhile I decided that it is very well polished and most of the time it was the same as reading any other book published by a big-name publisher. I decided that the issue I had with it is simply a matter of taking the reader for granted, not all of the time, but there were instances when I found myself being told exactly how each character felt in each moment and why they acted the way they did. It was in those kinds of details that left little to my own imagination and I wanted to figure things out more on my own, or I already knew those things and Edwards telling me was unnecessary. Towards the beginning there were a couple of moments when I wanted to get back into the action and figure things out as I went along, instead of being interrupted in order to give back-story or setting information as well. These aspects were not huge issues and I definitely enjoyed reading the book anyway. Overall I was really satisfied with this book and loved the ending, it made me want to read more of C.K. Edwards' work. I really hope that anyone who enjoys reading paranormal fantasy with a lot of action and a serious kick of romance will give this book a chance. It is only $0.99 on kindle and C.K. Edwards definitely makes it worth worth your money and your time.